Do these lights need a load equalizer to be used as a turn signal ? Use either LED Strips, LED Bars, or individual LEDs. These are sold in quantity one. One quantity is one Oval Lamp. 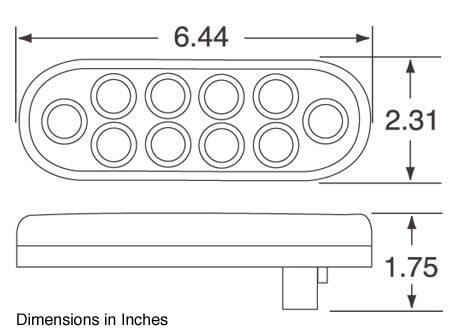 If I mount two of these in my rear bumper (clear lens facing backwards), will they produce enough light to serve as good backup lights? Do you have any pictures of the lights powered on(like you do with most other lights on the website)? Yes, these will be bright enough for Reverse Lights. Sorry, no photos at this time. Can these be used with a headlight flasher unit? 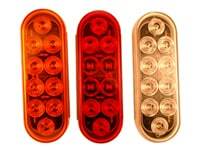 What is a headlight flasher unit? Three wire. They have both running light and brake lamp intensities. I can't remove the red leins ( how do I remove the red liens ) ? I want to put two screws to mount the light. also is the red lead + ? & black - ? white ground lead ? The red lens is sealed to the rest of the unit, and is not designed to be removed. The only way to remove it would be to cut it apart with a dremel, and then re-glue it back together. I'm not sure off the top of my head what the wiring colors are, but you can easily figure it out by hooking them up. Nothing bad will happen if you do it wrong. If you're using it in the correct application, it should be plug and play. That is subjective - to some people no, to some people, yes. Will they be bright enough to illuminate the road while driving in the fog? No. Will they be visible from the front of the car? Yes. Be creative. Glue, screws, tape, cable ties, or a combination of those.